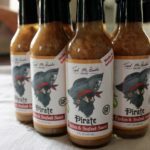 Sail your taste buds to the Caribbean with Tad McBride’s new Pirate Sauce. Using all-natural vegan ingredients—real orange juice, real coconut pieces and tasty spices—Pirate Sauce is packed to the gills with flavor. Broadside any chicken or seafood dish with Pirate Sauce and fall overboard into a maelstrom of tangy, sweet and spicy flavors. Prepare to hear shanties of gratitude from all yer mates! Commandeer yer own bottle of Pirate Sauce. Aye, anything else should walk the plank!